We’d love your help. Let us know what’s wrong with this preview of The Harvest of Sorrow by Robert Conquest. The Harvest of Sorrow is the first full history of one of the most horrendous human tragedies of the 20th century. Between 1929 and 1932 the Soviet Communist Party struck a double blow at the Russian peasantry: dekulakization, the dispossession and deportation of millions of peasant families, and collectivization, the abolition of private ownership of land and the concentr The Harvest of Sorrow is the first full history of one of the most horrendous human tragedies of the 20th century. Between 1929 and 1932 the Soviet Communist Party struck a double blow at the Russian peasantry: dekulakization, the dispossession and deportation of millions of peasant families, and collectivization, the abolition of private ownership of land and the concentration of the remaining peasants in party-controlled "collective" farms. This was followed in 1932-33 by a "terror-famine," inflicted by the State on the collectivized peasants of the Ukraine and certain other areas by setting impossibly high grain quotas, removing every other source of food, and preventing help from outside--even from other areas of the Soviet Union--from reaching the starving populace. The death toll resulting from the actions described in this book was an estimated 14.5 million--more than the total number of deaths for all countries in World War I. To ask other readers questions about The Harvest of Sorrow, please sign up. This is about one of the more appalling episodes in the history of the Soviet Union under Stalin. The centerpiece is the treatment of the ethnic and farming communities in Ukraine during 1929 to 1934. By following the dogma of Marxism-Leninism class war was declared on the so-called rich farmers of Ukraine labeled as kulaks. The definition of kulak varied – it could be a peasant farmer who owned a horse or two, a pig or two, who employed a labourer from time to time... Under Marxism private property and enterprise was to be abolished. So the kulaks needed to be eliminated; they were enemies of the people. Some were removed from their farms and sent to a remote Gulag to fend for themselves; others shot outright. More enemies had to be made when agricultural production sagged – so a class of sub-kulaks was found. This all lead to a loss of the most productive and industrious farmers and farmland – and the grain output kept decreasing to the stage where it was less than in the time of the Czars. The remaining peasants were forced onto collectives where a major portion of the grain output was requisitioned by the state. With the best farmers gone, with the produce seized by the government, with incompetent authorities in charge of the collectives – starvation set in. Stalin also saw the Ukrainian nationality as a threat to the centralization of power in the Soviet Union. The vast Ukrainian peasantry and its cultural elite had to be eradicated. The famine was deliberate. The author estimates that over 5 million Ukrainians died in the famine and millions more disappeared in the Gulag for dekulakization. The author also emphasizes how this collectivization negatively impacted other areas of the Soviet Union. This is a difficult book to read. There are a lot of statistics that the author uses to back up his statements. But it is the personal presentations that are most disturbing; the chapter on “children” being one of the most affecting. This has been used a source book for other volumes I have read on the Soviet Union, which is how I came to know of it. I never quite realized until reading this book just how severe and methodical this genocide was. This is what happens when ideology supersedes. In the terrible spring of 1933 I saw people dying from hunger. I saw women and children...And corpses...I saw all this and did not go out of my mind or commit suicide. Nor did I curse those who had sent me out to take away the peasants’ grain in the winter, and in the spring to persuade the barely walking...to go into the fields in order to “fulfil the Bolshevik sowing plan”. Hitler was a piker compared with Joseph Stalin. Stalin created the gulags in the 1920's, and created a man-made famine to eliminate most of the population of the Ukraine who refused get aboard his economic plan. This work is one of the pieces of evidence proving that more people on this earth were murdered in the name of State Communism than from any other single ideology. Mao, Pol Pot, and all of the other State sponsored secular tyrants learned their trade from Stalin. Stalin alone probably mu Hitler was a piker compared with Joseph Stalin. Stalin created the gulags in the 1920's, and created a man-made famine to eliminate most of the population of the Ukraine who refused get aboard his economic plan. This work is one of the pieces of evidence proving that more people on this earth were murdered in the name of State Communism than from any other single ideology. Mao, Pol Pot, and all of the other State sponsored secular tyrants learned their trade from Stalin. Stalin alone probably murdered at least 15 million of his own people. Stalin starved men, women and children--deported them, and imprisoned them without the least concern for the outcome. This campaign was completely hidden from the West by a state-orchestrated information and propaganda campaign which allowed intellectuals in the West to see only the "bright and positive" side of Soviet society while hiding the horrors of what was really happening. American and British journalists were taken on a happy ride by "Uncle Joe" and gullibly believed the picture he presented of the "advanced civilization" of the Soviet Union. They were never allowed to see the nightmare occurring in the Ukrainian and Siberian areas. In Russia there is plenty of room for hiding what is not meant to be discovered. The importance of this book is that it finally silenced those who denied that there had been a man-made famine in the Ukraine betweem 1929 and 1932. Within 5 years of its publication in 1986, the overwhelming major of academic historians in the West were willing to acknowledge that there had indeed been a Ukrainian "Holocaust". From the 1930s to the early 1980s communist intellectuals and fellow travellers in the West had essentially succeeded in convincing the public that the stories of the fam The importance of this book is that it finally silenced those who denied that there had been a man-made famine in the Ukraine betweem 1929 and 1932. Within 5 years of its publication in 1986, the overwhelming major of academic historians in the West were willing to acknowledge that there had indeed been a Ukrainian "Holocaust". From the 1930s to the early 1980s communist intellectuals and fellow travellers in the West had essentially succeeded in convincing the public that the stories of the famine were lurid lies peddled by angry, Slavic expatriates. In fact when I attended the University of Toronto in the 1980s many professors were still vigorously asserting that several years of poor weather had been blown up into a non-existent genocide. Conquest convinced the Anglo-Saxon academic community of the reality of the state-created famine because he used the language and tools of Anglo-Saxon academics in his book. More importantly he was a professor on staff at a major American university (Stanford) which gave his book a credibility that a comparable work by an expatriate could never have achieved. The left has had some success countering the claims of this book. While Conquest suggested a death toll of six million, his critics now assert that 3 million was probably closer to the mark. I think the debate his open. Nobody was keeping track of the numbers properly. What historians have to quantify the number of deaths are census figures for 1926 and 1937. What one finds that with the rate of natural population increase being sustained in the 1920s, there was a shortfall in the Ukrainian population of 15 million when the projected the numbers were compared to the actual. Conquests believes that 6 of the 15 million died in famine of 1929-1932 with the balance perishing in the Gulags which were created to re-educate Kulaks and bourgeois elements. The current state of the statistical debate is that 3 million is a safe estimate on the low end range of the likely number of deaths that can be attributed to the 1929-1932 famine. Fortunately for the reader, Conquest spends only one chapter on the statistics of the affair. One major part of the book examines the process of how and why the aggressive crop seizures took place in the Ukraine and Kazakhstan took place. Here Conquest takes advantage of fairly conventional archival material to create the narrative of the famine. Finally another substantial section of the book is devoted to testimonials of those who witnessed the events in the Ukraine. It is a curious thing, but the public schools do not teach anything about this subject in their history classes. This book should be required reading! It is not an easy read any way you look at it, but it is an important book. Please pick it up and give it a read. **The Harvest of Sorrow**is the first full history of one of the most horrendous human tragedies of the 20th century. Between 1929 and 1932 the Soviet Communist Party struck a double blow at the Russian peasantry: dekulakization, the dispossession and deportation of millions of peasant families, and collectivization, the abolition of private ownership of land and the concentration of the remaining peasants in party-controlled "collective" farms. 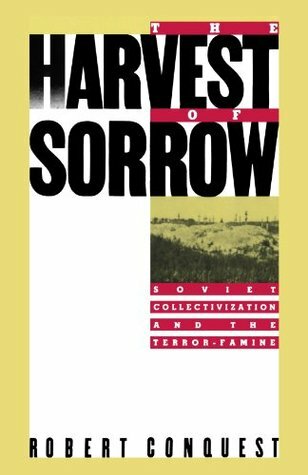 This was followed in 1932-33 by a "terror-famine," **The Harvest of Sorrow**is the first full history of one of the most horrendous human tragedies of the 20th century. Between 1929 and 1932 the Soviet Communist Party struck a double blow at the Russian peasantry: dekulakization, the dispossession and deportation of millions of peasant families, and collectivization, the abolition of private ownership of land and the concentration of the remaining peasants in party-controlled "collective" farms. This was followed in 1932-33 by a "terror-famine," inflicted by the State on the collectivized peasants of the Ukraine and certain other areas by setting impossibly high grain quotas, removing every other source of food, and preventing help from outside--even from other areas of the Soviet Union--from reaching the starving populace. The death toll resulting from the actions described in this book was an estimated 14.5 million--more than the total number of deaths for all countries in World War I. The best description of Stalin's forced collectivization of agriculture -- arguably the most monstrous crime of a monstrous century. A must read for anyone who believes communism is good. It isnt. Istoriko knyga apie Ukrainos bado metus. Istorinių faktų atpasakojimas primenant apie Sovietų valdžios žemės ūkio eksperimentus, žmonių sąmonės keitimą. Recommended to John by: bibliography of Montefiore's "Stalin: The Court of the Red Tzar. A most engaging and horrifying book. It conveys the circumstances and the means by which the Soviet government put to death at least 10 million peasants. Most of these people, the adults at least, opposed collectivation to some degree. Many others were members of national minorities, such as the Ukranians, who may not have opposed 'Soviet power,' i.e. collectivation, at all, but who were members of national minorities, Ukranians, for example, devoted to their national language, culture, traditio A most engaging and horrifying book. It conveys the circumstances and the means by which the Soviet government put to death at least 10 million peasants. Most of these people, the adults at least, opposed collectivation to some degree. Many others were members of national minorities, such as the Ukranians, who may not have opposed 'Soviet power,' i.e. collectivation, at all, but who were members of national minorities, Ukranians, for example, devoted to their national language, culture, traditions, etc., and who resisted assimilation into a homogeneous Soviet identity, behavior and culture. Earlier this year I read Timothy Snyder's great book Bloodlands: Europe Between Hitler and Stalin, which gives a truly horrifying account of the Ukranian famine. Snyder, however, gives a much lower figure than 14.5 million, something closer to 4 million. Why this huge discrepancy? This maybe points to a larger question. Famines have been common throughout most of human history. By the end of the first world most the inhabitants of the Russian empire were starving or severely malnourished. Nichola Earlier this year I read Timothy Snyder's great book Bloodlands: Europe Between Hitler and Stalin, which gives a truly horrifying account of the Ukranian famine. Snyder, however, gives a much lower figure than 14.5 million, something closer to 4 million. Why this huge discrepancy? Excellent piece of historical research and writing. Most Americans don't know anything about the frightful events that are detailed in this book. Conquest does an excellent job piecing together the facts to give the reader a complete picture of what happened. A must read. The best resource I've found to date on the Holodomor. An illuminating account of an overlooked human catastrophe. The 14.5 million death toll of the Holodomor is much overlooked and this book really should be on high school reading lists. Amazing account of a forgotten Genocide. Stalin's Terror famine. Why I did not read this when it was first published I do not know. Its publication date is 1986, before the fall of the USSR. I am left with 2 overwhelming impressions. Firstly, he argues very clearly about the responsibilities for the famine in Chapter 18. In chapter 17, he describes how Stalin successfully 'managed the message': " This lobby of the blind and the blindfold could not actually prevent true accounts by those who were neither dupes nor liars from reaching the West. But they could, Why I did not read this when it was first published I do not know. Its publication date is 1986, before the fall of the USSR. I am left with 2 overwhelming impressions. Firstly, he argues very clearly about the responsibilities for the famine in Chapter 18. In chapter 17, he describes how Stalin successfully 'managed the message': " This lobby of the blind and the blindfold could not actually prevent true accounts by those who were neither dupes nor liars from reaching the West. But they could, and did, succeed in giving the impression that there was at least a genuine doubt about what was happening and insinuating that reports of starvation came only from those hostile to the Soviet government and hence of dubious reliability. " (p 321). It seems to me that this is a technique that is still in use by governments based in Moscow. It has turned out to be a tried and tested way of confusing the world about what that government is actually doing. Secondly, Robert Conquest is horrifyingly 'prescient'. Here is a historian who has done his research, and concluded that the famine in Ukraine was Soviet policy. In the epilogue he writes: "It is not for me to make predictions about the course of events. But in any future crisis in the USSR, it is clear that Ukrainian nationhood will be a factor and a vital one. It has not been destroyed by Stalin's methods,nor have any of the later tactical shifts of his successors disarmed it'. If you wish to begin to understand life in the countries of the former USSR, both past and present, this is a book you should not miss. What an horrific event, one hardly spoken off because it was purposely kept quiet by the Russian Communist government. 14.5million people killed in a rush of Dekulakisation and Terror Famine, and yet it's not widely known. Seriously hard to read, not just because the subject matter is upsetting, but because this is a 1980's history - written for students of history or other historians, unlike many more modern histories, written for a more general audience. I initially tried to understand all of i What an horrific event, one hardly spoken off because it was purposely kept quiet by the Russian Communist government. 14.5million people killed in a rush of Dekulakisation and Terror Famine, and yet it's not widely known. Pretty dry but SO GOOD. Extremely well researched and presented. Paints a horrifying picture of the war against Ukrainian nationalist feeling in the 1930s, specifically the Stalin-approved/exacerbated famine in the Ukraine in which over 10 million people died of starvation. Robert Conquest is a well established American historian whose work has covered mostly Soviet history. His book, The Harvest of Sorrow, was published in the mid-eighties. It delves into collectivization under Stalin and places a focus on the Ukraine and the famine of 1932-1933. Conquest set forth to register in the public consciousness of the West an understanding of the events surrounding collectivization and the terror-famine, which involved millions of deaths. He explores the party’s struggle Robert Conquest is a well established American historian whose work has covered mostly Soviet history. His book, The Harvest of Sorrow, was published in the mid-eighties. It delves into collectivization under Stalin and places a focus on the Ukraine and the famine of 1932-1933. Conquest set forth to register in the public consciousness of the West an understanding of the events surrounding collectivization and the terror-famine, which involved millions of deaths. He explores the party’s struggle against the peasantry, and its struggle to crush Ukrainian national resistance. He starts us off by discussing the views of peasants which permeated the beliefs of the intelligentsia in pre-revolutionary times. Peasants were symbolical of either the Russian people, or, more popularly, of Russia’s backwardness of traditionalism and hindrance to progress. Ultimately, a shift toward socialism required the Bolsheviks to abolish private property in land and construct a plan to improve agriculture. Among the Bolsheviks, the peasantry fell into certain class divisions which involved notions that were varied and mostly inconsistent. One point which stayed insistent and clearly manifested itself in the actions surrounding collectivization was that the kulaks were enemies. Kulaks were the capitalists of the peasantry and were seen as involved in a struggle with the rest of the peasantry. The rest of the peasantry was expected to hate them, but if they wouldn’t, then the party would. Conquest views collectivization in terms of ethnic discrimination. In his focus on the Ukraine, he claims that the Ukrainians faced problems not only as peasants but as Ukrainians who possessed Ukrainian nationalism. They were an enemy to the state on not just one level, but two, and the famine must have been deliberately created to completely subordinate them. Aside from abolishing property, it was also important to diminish national identity, or at least merge identities. This was easier said than done in the case of the Ukraine. Conquest focuses on Ukrainian nationality in the second chapter, and he claims that the party viewed the Ukraine as a divisive element in the USSR with an urge to independence that needed to be extinguished. It is my analysis, though, that Conquest, like other historians, has placed too much emphasis on the Ukraine. Robert Conquest seems to have a bias. This may derive, in part, from his work experience: he was formerly employed by the British state department, specifically tasked with dissemination of anti-Soviet propaganda. It is not impossible that Conquest might have been influenced by propaganda generated by Ukrainian nationalists or even Nazis, with whom Ukrainian officials veritably collaborated. After all, famine spread to all of the Soviet Union, even Moscow. On top of that, there is evidence to show that Kazakhstan suffered higher amounts of casualties at certain junctures. A problem with Conquest’s book lies in the number of peasants affected by dekulakization that he offers. It may not be a simple task to estimate statistics for this period, but Conquest fails to stay consistent with his estimates. For example, in the chapter “The Fate of the Kulaks”, Conquest accepts the average Stalin offered for the normal amount of family members per peasant family. Yet, later in the book he uses a different average. Conquest also refers to the conversation Stalin allegedly had with Churchill, where Churchill asked Stalin how many peasants had been affected by dekulakization. Stalin did not answer this question, instead he raised his hands, which Churchill perceived as meaning ten million peasants (one million per finger). It is odd that Conquest would openly accept ten million as an estimate based off of this famous conversation, and possible misunderstanding. He does however cite the research of other historians, including Lewin. Conquest presents collectivization as a civil war, where the state had total victory over the peasants. He includes collectivization into his view of revolution from above, and he pushes the civil war notion in more specific of direction than Viola does. Conquest delves into the question of action against Ukraine more than the other authors. Compared to R.W Davies, Conquest’s estimates of deaths caused by dekulakization and the famine of 1932-1933 are considerably higher. It should also be noted that when Conquest wrote this book, other books of its sort had not yet existed. No one had yet written a book entirely about collectivization, therefore it is difficult to ascertain whether the book deviates much from pre-existing historiography. His stance is blatantly opposite of the Soviet position, though. Although this history book was written in the 1980's while the Soviet Union was still a country, the lessons it teaches still apply today. 1. While children learn about the evils of slavery, the horrible treatment of Native Americans, and the 6-million Jews killed during the Holocaust by the Nazis in the 1940's, very little is taught about the 14 million Russians, Ukrainian, and other ethnic groups that were starved and killed by the communist government in the USSR in the early 30's. 2. To this Although this history book was written in the 1980's while the Soviet Union was still a country, the lessons it teaches still apply today. 2. To this day communist ideologues deny that famine even occurred in the Soviet Union. No matter what the ideology (conservative, environmental, leftist, progressive, religious, or far right) ideologues will refuse to accept any information that puts their ideology in a bad light. And they will take any position to bolster their cause. They cannot be trusted. 3. The first step to increase state control over the people is to create an enemy class within society. The Soviet Union had the kulaks. The Germans had the Jews. Today most of our media tries to vilify the rich, blaming them for most of society's ills, while another portion of the media portrays the poor as lazy and unproductive. Both are deceptive lies. 4. Whether under the Tsar, Stalin, or Putin, Russia does not like Ukrainian independence. Harvest of Sorrows is very informative and thought-provoking. It would be a good book for a researcher or a student writing a report. But I found it a difficult read for a lay person such as myself due to the slog of statistics it provides. I would not read this book again, although I might refer to some of the statistics it provides. However I would read this author again. For this reason, I give the book three stars. This is a well written book with no wasted words, even if not an absolute masterpiece of style. And though history books are to me generally not 5-star, it seems inescapable that this is indeed a 5-star book because the story is so damned important. I admit to starting off through the first third in the frame of mind of collecting the material into my mind; to just absorb it as history. Now, at completion, I've come to realize that this is something different. Statistical figures, Soviet reports, l This is a well written book with no wasted words, even if not an absolute masterpiece of style. Statistical figures, Soviet reports, letters, Khrushchev's memoirs, hearsay, eye-witness accounts from both peasants and "activists", declarative sentences that are never laced with adjectives overtly meant to generate sensational emotionalism - that approach becomes something the reader can visualize, can ponder, and can imagine happening. The net effect of writing this way is actually much more powerful than trying to force the conclusion or the reaction. I am fully aware that there are several well-read people in the world who have commented that this book is anti-Marxist or anti-Soviet propaganda and largely difficult to prove. Let's for a moment grant that point; that only a fraction is proven true, maybe 25% true. That 25% is enough to leave a very serious impression, no matter how much history you've read. For follow-up, I'd like to note that it was worth taking 15 minutes or so to read the summary background of Mr. Conquest. Todo esto señala hacia la mediación dialéctica de las dimensiones «objetivas» y «subjetivas»: el «subkulak» ya no designa una categoría social «objetiva»; designa el punto en el que el análisis social objetivo se desmorona y la actitud política subjetiva se inscribe directamente a sí misma en el orden «objetivo». En lacanés, «el subkulak » es el punto de subjetivización de la «cadena objetiva»: campesino pobre - campesino medio - kulak. No es una subcategoría (o subdivisión) «objetiva» de la cla Todo esto señala hacia la mediación dialéctica de las dimensiones «objetivas» y «subjetivas»: el «subkulak» ya no designa una categoría social «objetiva»; designa el punto en el que el análisis social objetivo se desmorona y la actitud política subjetiva se inscribe directamente a sí misma en el orden «objetivo». En lacanés, «el subkulak » es el punto de subjetivización de la «cadena objetiva»: campesino pobre - campesino medio - kulak. No es una subcategoría (o subdivisión) «objetiva» de la clase de los «kulaks», el «subkulak» es una especie que desborda a su propio género (el de los kulaks), ya que los «subkulaks» también se encuentran entre los campesinos medios e incluso entre los campesinos pobres. En resumen, el «subkulak» nombra una división política como tal, al Enemigo cuya presencia atraviesa todo el cuerpo social del campesinado y que puede encontrarse en todas partes, en las tres clases campesinas: el «subkulak» da nombre al elemento excesivo que atraviesa todas las clases y cuyo brote debe ser eliminado.